Just after seasoning my skillets are perfect (black and with a smooth surface). But when I start cooking a steak, the seasoning is deteriorating. Indeed, I use to add some olive oil before my meat. In the part of the pan where there is no meat, the olive oil polymerizes and create some ugly and sticky bubbles. I cannot remove these hard oil bubbles when cleaning with salt and hot water. So, every time I cook something with requires high heat (like steak), the oil I added just before the food is polymerizing and ruins my smooth seasoning. On my older skillet, the surface is no smooth at all anymore. How can I avoid this and maintain a smooth seasoning? How can I remove the oil bubbles? 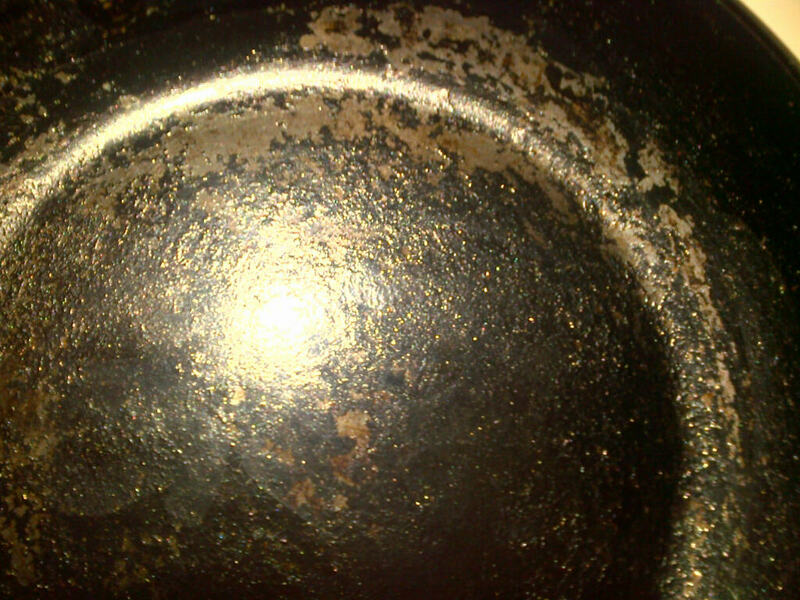 It looks like your pan needs a hard cleaning and a re-seasoning. I run into this about once every 2-3 months (depending on how much I use it). My tried and true method is to break some rules at this quarterly cleaning. I'll scrub with an abrasive scotch-brite, SOS Pads or similar scrubbing pad. During this time I often use about a quarter cub of baking soda, and towards the end I'll even use a little bit of dawn dish soap to make sure I've removed all of the particles, which amount to fine iron filings. I've even resorted to very high grit sand paper to even out some areas in very serious issues on my handle. Now it's important to rinse and dry the pan COMPLETELY. I then carefully rub crisco (less smokey than lard) all over EVERY surface of the now shiny and smooth pan. Then, invert pan in oven over a baking sheet or foil to catch any mess, and bake the pan at 500F for roughly an hour or two, or until it is uniformly black. If you have access to a clean, wood burning put, that's what my grandmother swore by, but I find the 500F oven more consistent. I am not certain if this would work for your high carbon steel pan pictured in the first photo though. I would read up on that. Your seasoning coat is too thick, a common error. Strip it down and start over with super thin coats of flaxseed oil, wipe the oil off with a paper towel leaving only the thinnest coat and then put in an oven at 500 for an hour. Cool and repeat 5-10 times. An oven is better than a stovetop to heat fully and evenly and up the sides. Follow the seasoning recipe in cooks illustrated exactly and don't improvise if you want the best results. My solution to this problem is to cook like my great grandmother -- using metal utensils. I wonder if the bigger problem here isn't the seasoning: it's that you are searing steak (at high temperatures) with olive oil, which has a really low smoke point. It's going to burn and polymerise very quickly. It's also going to be very unhealthy when burnt! Instead, try something with a high smoke point - groundnut or grapeseed oil, or even lard. They should both taste better when searing at high temperatures and avoid the little polymerised bubbles. And be healthier as well! Been using these pans for many years. Stop trying to force a seasoning on your pan! Take the pans you have and spray them with Easy Off oven cleaner in the yellow can. Put in garbage bag and let sit for a few days outside. Rinse off and repeat until seasoning is removed. Pan will not look shiny/new. The steel will likely be discolored in places. Wash with soap to get all of the oven cleaner off. Now use the pan with an appropriate oil for the temperature and food being cooked. Olive oil is probably not best for steak. Bacon or beef fat, avocado oil, or peanut oil work better for me depending on temp. The best way to get a properly seasoned pan is to use it normally. 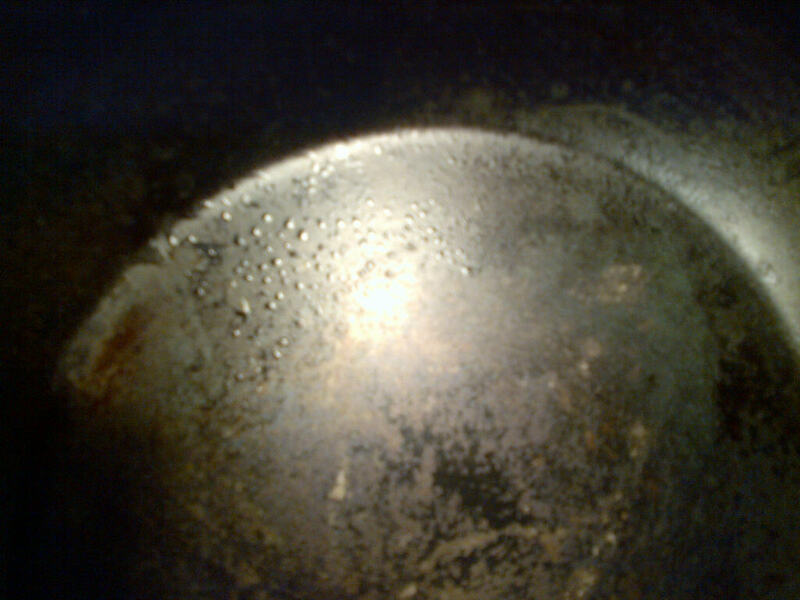 When done cooking, deglaze pan with water if necessary and wipe out pan. A plastic pot scraper works well here for stubborn bits. You can also scrub pan with green Scotchbrite pad. One or more of my carbon steel pans gets used almost daily. I do the Easy Off seasoning strip every few years or so to remove any buildup and the pans keep getting better and better. 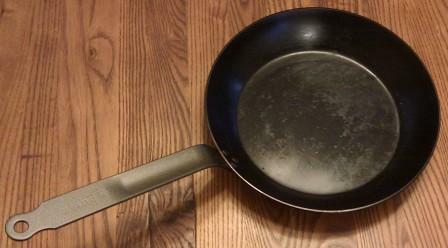 I have a 10 year old recently stripped pan that is very discolored but has no seasoning buildup that is slick as snot. The patina on the steel is also quite attractive. I will probably strip it again in 4-5 years. Not the answer you're looking for? Browse other questions tagged oil cast-iron seasoning-pans carbon-steel or ask your own question.